US researchers have shown that financial losses from hurricanes could increase by more than 70% by 2100 if oceans warm at the rate predicted by the Intergovernmental Panel on Climate Change (IPCC). The finding is based on the panel’s most severe potential climate change scenario and is predicted at an 80% confidence level. The results of the study, which focused on 13 coastal counties in South Carolina situated within 50 miles of the coastline, including the most populous county, Charleston, are drawn from a model simulating hurricane size, intensity, track and landfall locations under two scenarios: if ocean temperatures remain unchanged from 2005 to 2100; and if they warm at a rate predicted by the IPCC’s worst-case scenario. Under the 2005 climate scenario, the study estimates that the expected loss in the region due to a severe hurricane, one with a 2% chance of occurring in 50 years, would be US$7bn. Under the warming oceans scenario, the intensity and size of the hurricane at the same risk level is likely to be much greater, and the expected loss figure climbs to US$12bn. The model drew on hurricane data for the last 150 years gathered by the National Oceanic and Atmospheric Administration (NOAA), then created simulated hurricanes under the two scenarios over 100,000 years and estimated the damage from every storm that made landfall in the study area. The researchers did not find that warming oceans will lead to more frequent hurricanes; only that warmer seas will lead to higher wind speeds and storms that are greater in size and therefore cover a larger area. The losses are calculated based only on wind and wind-driven rain and do not include the large financial impacts of storm surge or flooding. 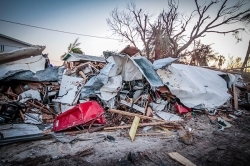 The increasing severity of hurricanes will also affect hurricane modelling, Rosowsky said, and consequent predictions of damage and financial loss. In a postscript to the paper, which will also be published as a chapter in a forthcoming book, Rosowsky cites the three catastrophic storms of the current hurricane season – Harvey, Irma and Maria – as examples of events so severe they will shift assumptions about the likelihood that such severe hurricanes will occur in the future.